“It’s not rocket science. It is just where technology is,” said Wally Stegall, technical fellow at The Morey Corp., which serves the electronics market. He noted that while the aerospace and automotive industries are the furthest along with diagnostic maintenance, the trucking industry has reached a point that SAE International defines in its JA6268 Recommended Practice as the second level of its five levels of diagnostic maintenance, where telematics is providing real-time data to technicians, who then conduct manual diagnosis and repair. According to SAE, at the third level components issue proactive alerts to augment diagnosis and repair, and can more completely capture issues. Stegall said the trucking industry has made a start in that direction. “For me, the key is for the industry to have a consensus on driving forward,” he said. The new approach will require “health-ready components and systems, more sensors with more resolution, plus big-data processing to push the edge computing that makes warranty proactive,” he said. Edge computing operates on instant data generated by sensors. Health-ready components are built to interface in that way. A recent survey of 250 owner-operators and midsize fleets found a leading 33% of the companies reported predictive maintenance was the top technology investment they planned in the next 12 to 24 months. Of those surveyed, 28% reported they expected predictive maintenance to be the technology with the biggest impact in the next three years. That trailed only electronic logging devices, at 47%, and was tied for second place with route optimization. Bibby Financial Services conducted the survey between Jan. 1 and Feb. 28. Eventually, Stegall said, the warranty process will change. Truck makers and suppliers “will want to do warranty claims proactively because they are going to pay anyway. Being proactive limits liability, and good service improves market position,” he said. At the same time, condition-based maintenance could spur parts sales. 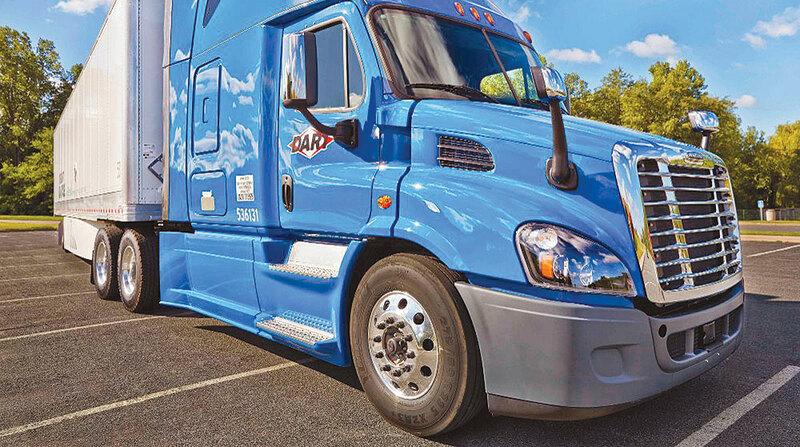 “We have seen some tightening up of replacement mileages on components to avoid issues with roadside inspections,” said John Blodgett, vice president of sales at MacKay & Co.
Alerted by prognostics to a problem with a component or part, a fleet may not choose to take a risk on it performing another 20,000 miles before regularly scheduled truck maintenance. “Because it’s 50-50 that they’ll have to replace it sooner,” he said. For the vast number of trucks on the road, predictive maintenance remains experience-based, said one fleet executive. Jack Poster by John Sommers II for Transport Topics. “One of the reasons we went to vehicle maintenance reporting standards (VMRS) coding is so we could see what product failure is happening at what time,” said Brett Wacker, vice president of maintenance at Dart Transit Co. The VMRS coding standard is licensed by Technology & Maintenance Council of American Trucking Associations for equipment maintenance applications, and provides users with a method to track repairs, according to Jack Poster, the council’s VMRS Services Manager. Eagan, Minn.-based Dart operates about 2,300 tractors and 7,100 trailers, and ranks No. 68 on the Transport Topics Top 100 list of the largest for-hire carriers in North America. At best, experience-based predictive maintenance can reach 50% of unexpected failures because there are so many variables involved, Wacker said. Oil changes, the valve train, air drier cartridge replacements, diesel particulate cleanings and DEF filters, for example, are part of what can be evaluated based on past experience, he said. But tomorrow is shaping up differently. What could be monitored and diagnosed with sensors in real time are the engine, aftertreatment systems, automated transmissions, HVAC systems, low-voltage disconnects, cab components — and, with harmonics — the drivetrain and wheel ends, he said. Wacker said he’s looking forward to the day when a tractor and trailer each reports 100% of the time if it is ready to go.